Robin Wood is a bowlturner living in England. I came across his work last week and thought I'd pass the link along. 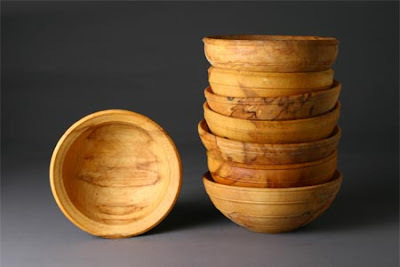 He works with green wood and a foot powered pole lathe- creating bowls based on traditional English and Scottish designs. Spoons too. I like the utilitarian purpose and design of his work, as well as the scholarly yet easy attitude he seems to bring to it. The designs aren't necessarily artistic statements. The forms are simple, functional, sturdy and honest. They're rightly beautiful. Why so? Perhaps it the familiarity that comes from turning thousands of pieces. Perhaps he's gotten past thinking about it. On the contrary, so much of what I see in contemporary bowl turning comes down to being, well, downright ugly. Wood grain and pattern are poorly utilized in an attempt to make an 'artistic statement', or one-off piece. Forms show no grace. Wasted wood. Please have a look at Robin's website and blog. Let him know what you think.